Sunday, 6 July 2014: One Year and Ninety Seven Days Old. 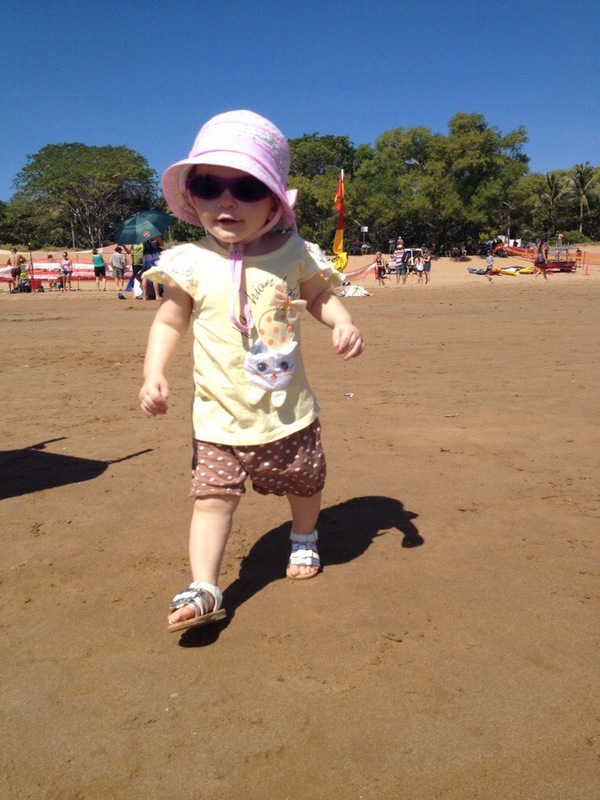 I took Ayla down to the Beer Can Regatta this afternoon where she had a ball playing on the beach. I don’t know what I was thinking when we left home, but swimwear wasn’t one of them, and within minutes of arriving Ayla was paddling about knee-deep in the ocean. It didn’t take Ayla long to spy an abandoned bucket and spade which she confidently took ownership of, filling the bucket one spec of sand at a time. Finally Ayla’s interest in the sand wore off and her curiosity of the water took hold. Without a glimmer of fear Ayla toddled straight into the sea and up to her waist, with no sign of slowing down. Fortunately the bay was calm and the waves were more like salty ripples which meant that apart from Ayla’s lack of concern for drowning it was a safe and fun place to play. We were beachside for a good couple of hours before my back was hurting from bending over holding onto my tearaway, and my brain was hurting from trying to pre-empt her next daredevil tactic! We made it home and spent the rest of the afternoon relaxing, just like what Sundays are for.